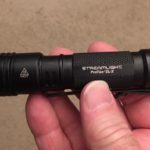 There are dozens, if not hundreds of tactical flashlights available for EDC (Every Day Carry), so let me tell you about an awesome one that you may not have considered. 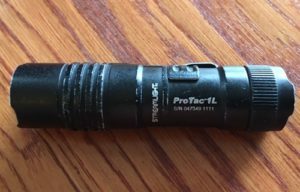 I like it so much, I decided to write a “best tactical LED flashlight review” so I can share what I found! My pick is the Streamlight Protac 2L-X USB Tactical Flashlight. You already carry a flashlight, but are not happy with it and are looking for something better. You want to start carry a tactical LED flashlight, but don’t know which one will suit you. You can’t stop buying cool flashlights because you love gear! You are buying a gift for someone. If this is you, you cannot go wrong with my recommended model! I was in category 1, but honestly I am also a card-carrying member of category 3! I recently changed to a completely different model and I will tell you what my issue was with my former light. Over the years I have used a couple of different flashlights for everyday carry, and I just moved to a new one which I think is the best pocket tactical flashlight available, at least for my purposes. There are definitely many fine tactical flashlight that I have not tried, and there are lots of excellent brands that are guaranteed to satisfy. Brands such as Surefire, Fenix, 5.11 and Maglite manufacture some of the best flashlights on the market. There really is no flashlight that is the absolute “best” because it all depends on what you are looking for in a pocket flashlight, and what you expect it to do for you. 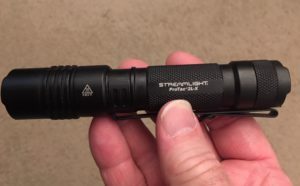 I did a ton of research and read lots of reviews on all makes and models and decided that I would go with the Streamlight Protac 2L-x LED Tactical flashlight for my EDC light. The one brand you will always find on any top ten best tactical flashlight list is Streamlight. 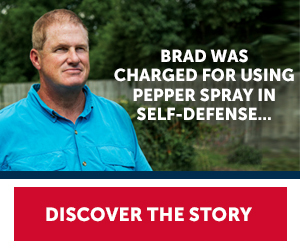 That is one reason why this is my preferred brand. First, I will list the features that make this an awesome flashlight, then I will go into detail as to what made me choose this particular light for my EDC. Powerful. 500 lumens is perfect for disorienting an attacker as well as flooding an area with light to see where the heck the dog went when he went after that skunk! Has a low power setting too. My flashlight is with me all the time and for most of my everyday needs, 40 lumens is plenty and it conserves the battery power. No need to nuke everything with 500 lumens! Long run time. This LED light will run on HIGH for 2.75 hours with the CR123A batteries and 3.25 hours using the included rechargeable 18650 battery! This is really good. On low, you get 40 lumens for 30 hours! Rechargeable. This battery does not need to be charged very often, but I like to charge it once a week so I know it is always ready to go. I already have a ton of devices that need charging on a regular basis (Fitbit, headphones, iPhone, portable bluetooth speaker) that it is no big deal to add the Streamlight. Dual power. Streamlight calls this “Dual Fuel”. I doubt I will ever need to take advantage of this feature, but it is a big one. If I need the light and I am not sure if it is chargered, I simply insert a couple CR123A batteries and I am ready to go! And I have a small arsenal of these babies from my prior flashlight! Perfect size. This light fits in my hand comfortably, but sticks out enough that it can easily be used as a striking weapon if necessary. It is 5.14” (13.0 cm) long. Yet it is small enough to carry in most tactical pants. My former Streamlight 1L is a great small flashlight, recommended if a small size is important to you, but it cannot double as anything. Streamlight quality. Streamlight is one of the most reliable, high quality tactical light companies there is. I refuse to buy a cheap knock off. Enough said. Programmable. See the next section for details on this handy feature. Rugged. Drop it, throw it, smash your attacker in the face with it, the light will work like nothing happenend! Waterproof. All weather, no worries! Lifetime Limited Warranty. Streamlight backs their products. The Streamlight 2L is just a little bit long for EDC, but I wear tactical pants almost all the time so it works for me. A shorter flashlight will fit in more pockets. You must remove the battery from the flashlight in order to charge it. This does keep it waterproof, but it is still a con in my book. Here is the Fact Sheet from Streamlight. The feature that sold me is the dual fuel feature. This flashlight takes either two Type CR123A Lithium batteries, or one 18650 Lithium Ion Rechargeable Battery. It comes with an 18650 battery. The main reason I was looking for a new tac light was because the Streamlight 1L I carried for many years (see pic) has one thing that drives me crazy. That thing is that when the battery gets low, the light fails extremely quickly without warning. I am otherwise thrilled with that flashlight, and I do recommend it. I do not believe this is a technical flaw, because the reason this happens is the circuitry is design to get the brightest light for the longest amount of time. This is a common issue with the better tactical flashlights, and if you change the battery often, it will not be an issue for you. However, I am cheap, and the CR123A batteries are not! Option 1: Carry a spare CR123A battery. 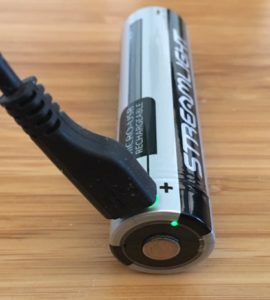 I did try this for a while but ultimately did not like to carry a lithium battery in my pocket all the time. Option 2: Carry a backup flashlight. A backup flashlight? I don’t think so! Option 3: Get a flashlight that takes cheaper batteries and replace them often. I considered lights that take AA or AAA batteries that are not nearly as expensive as Lithium CR123As. However, the problem with lights that take AA or AAA batteries is that theThere is a reason that a lot of tactical flashlights use CR123A or 18650 Lithium Ion batteries. The difference in power output is huge. I was not going to settle for a lot less lumens. It just isn’t cool. Option 4: Find a different flashlight. Winner! I started my search for a flashlight that will not suddenly fail due to a dead battery. If you like the small size of the Protac 1L, it is an excellent pocket flashlight and uses one CR123A battery and kicks out 275 lumens on high and 22 on low. Runs 2 hours on high and 24 hours on low! I carried this little powerhouse for years. Get yourself some of these CR123A batteries if you are not going to go with the rechargeable. This Streamlight uses an exclusive feature called TEN-TAP® Programming. With ten quick taps of the button, you can change the way the light operates. There are 3 modes: High-Strobe-Low, High, or Low-High. The first one means that the first press of the button gives you High power, if you press it again quickly, it will go to Strobe mode, tap again and you get low power. The second program means you will get High power only every time you press the button. I always set mine to mode 3, low-high, since most of the time I only need low power, but I know high power is available if needed. I wear tactical pants every day so I have plenty of pockets to keep the flashlight. I suspect that if you are reading this article, there is a pretty good chance you are wearing 5.11 Taclite Pants as well! However, today’s tactical flashlights are small enough to be carried in most pants pockets. This one is well suited to be carried in a back pocket of a pair of jeans. The well-designed clip allow the light to be carried either lens up or lens down and still be securely clipped to your pocket. The Streamlight 2L-X has a unique clip that allows it to be securely clipped facing up or down. I prefer facing down as I find it easier to pull it out and activate it that way. Most of my tactical pants have either a dedicated pocket for a flashlight, or a pocked with compartments or elastic webbing that securely holds the light upright and ready for fast deployment. Years ago, before LEDs and tactical flashlights, only police officers and fireman ever had a flashlight on them. That was primarily because they were huge!! The best, most powerful models used 4 or 5 “D Cell” batteries! These flashlights were also good as defense weapons as they were a foot long and weighed about 5 pounds! Today’s technology allows for a pocket sized light that is far and away brighter than the antiques of yesterday. Now anyone can carry a small lightweight light in their pocket, purse, brief case, range bag, backpack or carry-on luggage. I personally believe that one of the most important every day carry items is a flashlight. Of all the items I carry on my person, the one I would not want to be without is a small powerful tactical LED flashlight. I certainly carry it for self defense purposes, but I find it comes in handy a lot more than I expected. If you want to learn how to use a flashlight in conjunction with a handgun, see my review of Front Sight Firearms Training Institute. Concert venues have steep steps and my wife and I are not young anymore! A handy flashlight is a life saver! I drop a lot of things. In the garage, in the kitchen and stuff always rolls under the range, under the car or into a dark corner. Gonna need a light to find it. I used to be a Field Service Rep for a medical device company and was constantly looking at teeny tiny serial numbers on equipment that was under a desk. You’re getting out of your car at night and you hear something small hit the ground, just pull out a flashlight and see if you just dropped your credit card, phone, keys or $20 bill? Taking the trash out at night, especially in winter when it gets dark early is always a dicey experience. My trash cans are around the side of my house where there is absolutely no light and I need to check to make sure I’ve got all the trash and recycling and drag it out to the street. I was driving at night to a friends house for a social visit in their driveway is extremely narrow so I had to park very close to the edge of the driveway and my wife could not see where she was walking to the good old flashlight came out she was stepping. As you can see, I use my flashlight often and I expect it to work every time I pull it out. That is why I recommend the Streamlight 2L-X. 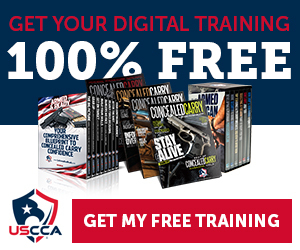 My name is Dave and I have been carrying concealed daily for over 10 years and have extensive Defensive Handgun training and Practical Rifle training. Lots of people underestimate the value of a quality flashlight, until they need one. Reliability and durability are key features when it comes to something like a flash light. For some it’s an afterthought and for some having a quality flash light in certain situations can mean life or death. You offer a great product that is not too expensive. Thanks for a quality review about a quality product! Danny, thanks for reading my Best Tactical LED Flashlight review and leaving a comment! As I stated in the article, I always carry a flashlight and I expect it to work flawlessly when I need it!